​HERO Theatre presents classical plays and new works. We seek to use art to model and bring about social progress. HERO Theatre examines and challenges the traditional definition of classics. We produce works to ensure that equity, diversity and inclusion remain in the forefront of both the classical and contemporary classical American cannons. At HERO Theatre, we create and nurture collaborations between artists of different racial, ethnic, cultural and socio-economic backgrounds. We seek to create opportunities for marginalized voices. We believe that honoring an artist's origin, age and experiences makes for truthful, unique and memorable theater. The inspiration for HERO Theatre came about backstage in the wings of the Laura Pels Theatre, during the Roundabout Theatre Company's production of "The Milk Train Doesn't Stop Here Anymore." The show's star Olympia Dukakis turned to cast-mate Elisa Bocanegra and asked, "Why do you look so sad all the time?" ​Bocanegra confided in Dukakis that she was saddened by the lack of equity and inclusion in theater. "There are so many actors of color and women in need of opportunity," responded Bocanegra. She was also disappointed that many of her friends who wanted to do more classics were up against a wall because they didn't have the resources to go to graduate school. Bocanegra continued, "I just wish we had a place where we can all work together. Actors who are well trained can learn from actors who came up in the day where you just struggled. When life experience and hitting the pavement equaled an MFA. A place where my white friends can work alongside the Puerto Rican actors that I grew up doing community theatre with in the Bronx. There is so much to learn from one another." Dukakis replied, "Elisa it's time for you to hustle and start your own company. A place where you can grow and help others like you." Shortly after, HERO Theatre was born. The company started with a benefit reading of Chekhov's "Three Sisters" directed by Obie-award winner Lisa Peterson. Olympia Dukakis hosted the event and still leads the company's Advisory Board. Artists that have worked with HERO include William H. Macy, Olympia Dukakis, Adam Rodriguez, Joe Manganiello, Justina Machado, Stephanie Beatriz, Ivonne Coll, Jeanine Mason, Isabella Gomez, Austin Pendleton, Zach Villa, James Martinez, Lynn Cohen, Brent Jennings, John Frank Levey and Omar Metwally. Some of the most beloved writers in America have contributed their work to HERO including Pulitzer-winner Quiara Alegria Hudes, Colman Domingo, Larry Charles, Jennifer Haley, Annie Weisman and Migdalia Cruz. 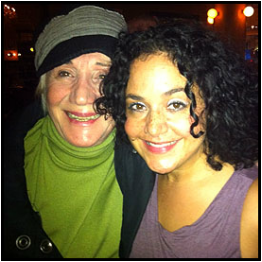 ​Our Producing Artistic Director, Elisa Bocanegra founded HERO Theatre in August 2011 at the suggestion of her colleague, Academy Award-winner Olympia Dukakis. Elisa was the inaugural recipient of the Paul Nicholson Arts Management Fellowship at the Oregon Shakespeare Festival in 2015. Most recently, she was the recipient of TCG's Leadership U grant which provided her the opportunity to be part of the Leadership Team at the Oregon Shakespeare Festival. As an actor she has performed at many theatres including the Goodman Theatre, Roundabout Theatre Company, South Coast Rep, Mark Taper Forum/Center Theatre Group, Hartford Stage, Oregon Shakespeare Festival and the Williamstown Theatre Festival. Her film debut was in the Sundance Film Festival winner, "Girlfight" starring Michelle Rodriguez and directed by Karyn Kusama. She is currently part of the cast of the national tour of "Steel Magnolias," where she plays Truvy Jones.